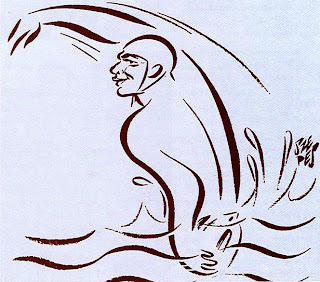 Humoristic drawing of Bela Szepes presenting the legendary Hungarian player Dezso Gyarmati. Dezso Gyarmati has been the most charismatic player of the 50's and 60's winning the gold in 1952 and 1956 Olympics and 1964 and 1962 European Championships. Source: Un siglo de Water Polo y de filatelia temática en el mundo; Juan Antonio Sierra.